Randy Seaver's Saturday Night Genealogy Fun this week is to conduct some research on one's own birthdate. 2) What has happened in recorded history on your birth date? Tell us how you found out, and list five events. 3)What famous people have been born on your birth date? Tell us how you found out, and list five of them. 1) Using one of my favorite perpetual calendars/calendar converters at Calendarhome, I confirmed I was born on a Tuesday. The date is January 21st on the Gregorian Calendar, and the 2nd of Sh'vat on the Hebrew calendar. 76 BCE - Hashmonean King Alexander-Yannai (Jannaeus), a Sadducee and an enemy of the Pharisees, died on this date. Known as a ruthless leader, he persecuted the Pharisees and those loyal to them (approximately 50,000 were killed in the years 82-76 BCE). As a result, the day of his death was declared a holiday in Talmudic times. 1800 -The yahrtzeit (anniversary of the death) of Chassidic Rabbi Meshulam Zusha of Anipoli (1718?-1800). He was a disciple of the 2nd leader of the Chassidic movement, Rabbi Dov Ber of Mezeritch- The Great Maggid of Mezeritch. The TransylvanianDutch chapter of the Academy of Genealogy and Family History has participated in all prior years, and will do so again. For those who are nostalgic, here were our selections in 2010, 2009, and 2008 from the prior year's posts. On April 1, 2010 I proved that Lucille Ball was the grandmother of her husband, Desi Arnaz by using Ancestry's OneWorldTree. Which every genealogy researcher knows is extremely trustworthy. The Chicago Key Puncher's Finish - A poem written by the prolific author, Anonymous, and discovered in my grandmother's collection. When Traditional Methods Fail - I discovered someone online offering to conduct what could be described as slightly untraditional genealogical research. It involves crystal spheres. Winner - A Tale of Two Grandmas - I created a joint timeline for both of my grandmothers, allowing me to see similarities and differences in their life journeys. Ode to Sarah Hartley Denyer Foster - A poem I wrote concerning a great great grandmother. The Labors of Hercules - a post concerning my discovery that my 8th great grandfather owned a slave, and the information I could find about that slave. A transcription of an interview conducted with my paternal grandmother in 1987. I divided it into ten minute segments, and there are seven posts in total. I link to the first post above, and the rest can be found in my index of Amanuensis Monday posts. A transcription of an interview conducted with my paternal grandfather in 1987. I divided it into ten minute segments, and there are nine posts in total. I link to the first post above, and the rest can be found in my index of Amanuensis Monday posts. Did you really think I was going to choose one over the other for an award? A photograph taken circa 1894 of the four elder children of Melvin and Margaret (Denyer) Van Every. 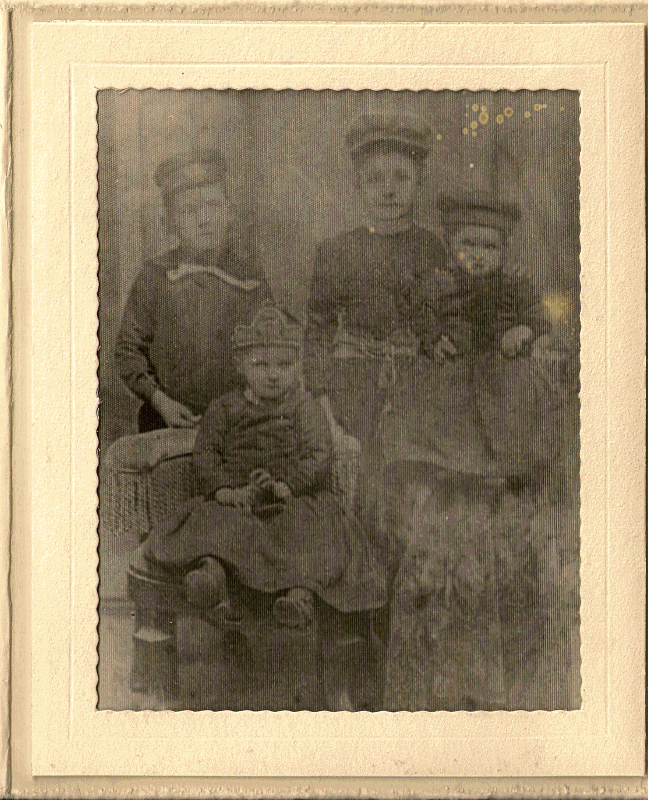 Taken approximately six years prior to the birth of my maternal grandmother, Myrtle Van Every, it shows her older siblings Minnie, Sam, Willa and Evva. A postcard my maternal grandfather, Martin Deutsch, sent home during the war. No one at his APO had received mail in ten days. 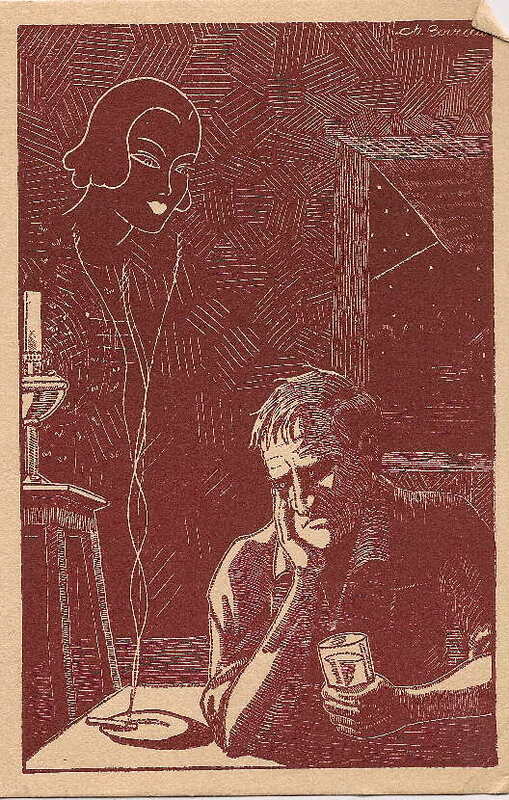 The artwork on the postcard illustrated how he felt. In a post on alternatives to scrapbooking, I included this collage concerning the smoking habits of my paternal grandparents, and the result. In the comments it was suggested that this matches the intent of scrapbooking. But there are no fancy backgrounds, and no need to cut up old photographs since it is all done with image editing software. This ends the awards for the five main categories. However, last year I came up with my own additional category. I plan to award it in any year there are nominees. Best Genea-Bloggers in a Supporting Role - I present awards to show my gratitude to other Genea-Bloggers who commented upon, or in some other way responded to an entry, providing me with more information on my family. In February of 2010 I griped about my lack of success through RAOGK and FindAGrave to obtain photographs of my great grandparents' tombstones. John Frank of AncestryChronicles lived nearby the cemetery in Chicago and volunteered to take the photographs once the snow melted. In May of 2010 Sharon of KindredFootprints discovered some Van Everys in her family tree. I was able to help her with some information on her cousin, and when she made a trip to Niagara, Ontario she took some photographs of the Van Every plot at Warner Cemetery. In July of 2010 I discovered the will of Barnard Goldfinch at the UK National Archives. I believed him to be my fifth great grandfather, but I was unable to decipher the will as the 18th century script was beyond my ken. I did post the images though, and Martin Hollick of The Slovak Yankee, was able to transcribe the will using his experience with even earlier English script. Over the next few years – with the sesquicentennial of the United States Civil War – there will be more of a focus on ancestors who fought in the conflict as well as those ancestors who supported certain causes and movements such as states’ rights or the abolition of slavery. It is said that history is written by the winners. However, with the advent of blogging and the ability for almost anyone to have a platform where they can write and express their opinion, the stories of those on the losing side of these causes and movements are being told. How do you handle telling such stories, especially if your ancestor was pro slavery or, for example, anti women’s suffrage? What if there is no evidence as to their opinions or positions yet they fought for the losing side in a war, such as World War II? Is there, in fact, a “wrong side” of history? I also don’t attribute the telling of the stories to the internet. The losing side has had a voice in history since Gutenberg. I read Mein Kampf in high school. Yes, it was presented in the context of the writings of a madman, but I read Hitler’s words. I also read the Communist Manifesto. I’ve also read speeches given by William Jennings Bryan. Whether a student is encouraged to read the works of those whose opinions weren’t favored by history depends entirely upon the quality of the school. However, it doesn’t depend upon the internet. It’s possible the internet is providing this information to a greater number of individuals – acting as a school-replacement for those who need one. Fortunately, I have no knowledge of relatives who fought on the losing side of World War I or II. Since I can trace my maternal ancestry back to Germany, I can assume I have some distant cousins, but our most recent common ancestor would likely have lived during the 17th century. My Great Uncle, Sam, was accused of pro-German sympathies, but his accuser was an ex-wife, who might not be the most reliable source. That said, there are several descendants of Thomas and Katherine Stoughton whose political beliefs are in opposition to my own. From William Stoughton, Chief Magistrate over the Salem Witch Trials to political commentator, Patrick Buchanan. I find the presence of John Kerry and Franklin Roosevelt, along with the poets Harold Hart Crane and Oliver Wendell Holmes in the same list of descendants ample balance. I do have ancestors who fought for the Confederacy, and others who were United Empire Loyalists. I’ve blogged before about my discovery of a slave-owning ancestor. The political battles today can still get rather heated. I have good friends with whom I disagree strongly on some issues. I have no idea what 'side' I will be viewed on in 20, 40 or 80 years. I don't believe in hiding information about ancestors from future generations. I will respect kin and refrain from blogging about some things if the relative in question has close living descendants. But if the event in question happened 150 years ago or more, I'm not going to hesitate much blogging about it.